Say this for the Optimus G: it doesn't skimp. LG went for broke to shake off its mid-range reputation, cramming its latest flagship Android phone full of goodies. But specs don't always equal performance. 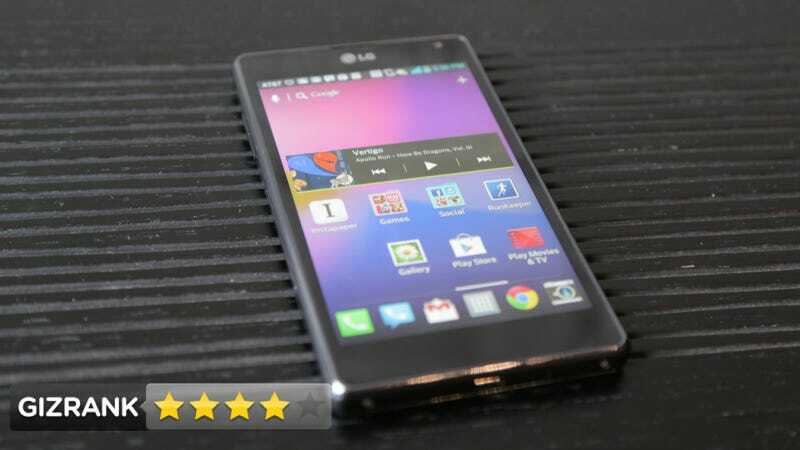 LG's best attempt at a high-end phone. It runs Android 4.0 (Ice Cream Sandwich) with LG's custom UI 3.0 skin. It's available in slightly different AT&T and Sprint versions. Android users who crave some real horsepower. In both of its incarnations, the Optimus G is extremely rectangular by today's standards, and it feels solid. It's got a 4.7-inch "True HD IPS Plus" screen under Gorilla Glass 2, powered by Qualcomm's new quad-core Snapdragon S4 Pro, 2GB of RAM, with a 2,100mAh battery, LTE, and NFC along for the ride. The AT&T model has an 8MP camera, whereas the Sprint and unlocked versions have 13MP cameras. Note: We spent the majority of our time with the AT&T version. We did, however, use the 13MP version for photo tests. Your first thought will be "Holy crap, it's fast!" You're right. Your second thought will be, "Wait, where the hell are those settings I want to change? What the hell is wrong with these menus!?" You're right again. The speed makes up for it though. Apps fly open, and there's no lag anywhere in the system. Again, it's the speed. We don't put a whole ton of stock in benchmarks, but it soundly beat everything else in some of them (Geekbench 2), and was always at least in the top five on others. It actually makes the Samsung Galaxy S III feel slow by comparison. It's the skin LG slapped on Ice Cream Sandwich. There's a very blocky, 2D look to it that makes the Optimus G look like it's running a much older version of Android, and the menus don't make any sense in terms of placement or prioritization. The earpiece on the Optimus G is right where the glass meets the metal rim at the top, which creates a sharp edge. It's a bit like holding a cheese-grater to the side of your head. Even if you don't use your phone to talk much, it shouldn't hurt when you do. The software has some redeeming qualities. The customizable quick menu in the notification screen is wonderful, and the camera software makes everything easily accessible. The latter also has a speak-to-click feature, where you can say "cheese" or "whiskey" and a photo will snap. Samsung had that first, but the difference is that LG's actually works every time. All pros and cons considered, it's on par with Samsung's TouchWiz UI. Not surprisingly, the 13MP camera on the Sprint version trounces the AT&T Optimus G's 8MP snapper. It's noticeably sharper and performs much better in low light. The 13MP lens adds a tiny bump to the back (the 8MP version is flush), but it's hardly noticeable and well worth the trade-off. The 8MP isn't bad, but the 13MP is better. Data speeds on AT&T's 4G LTE network were excellent. Sprint has barely rolled out their LTE network anywhere, however, so if you want that 13MP camera, you're going to be stuck with 3G data speeds until they get LTE up and running in your area. That may be a deal-breaker for some. Battery life is excellent (tested on the AT&T version with LTE on). Even after lots of gaming with the screen on full blast, streaming music, and GPS tracking, it lasted into the evening. You can buy yourself even more time by switching to Eco mode, which "extends battery life by dynamically optimizing CPU control policy." The lock screen could be a big plus, but it falls short. It can display some "If lost please contact..." information if you like, but it also displays your next upcoming appointment, which you may not want. You can't choose which calendar it pulls from, and you can't turn it off. There are four shortcuts (for Phone, Messaging, Browser, and Camera). Great, but you can't change them. So if you don't use Messaging or Browser, but use say Google Voice and Chrome instead, you have useless shortcuts. Would be nice to be able to customize. Call quality was just okay on both phones. Not bad, but we've certainly heard better elsewhere. Also, it didn't help that our ear was being scratched off. LG's custom keyboard is very error-prone if you use it as a sliding keyboard, but is a bit better if you're just tapping. You can also choose to use the stock Android keyboard (or download another) instead. To put it bluntly, the Optimus G looks more like a tool than a toy. The square corners make it feel bigger than it is. The back has a subtle 3D pattern to it under the glass, but it's a major finger-print magnet. Not yet. This is an excellent phone; in fact, I'd choose it over a Galaxy S III. But! It's looking like the Optimus G may get even better in a matter of weeks. Rumors are churning that this'll be the template for the next Nexus phone, which means you'd get all the benefits of LG's great hardware, but with the much cleaner, faster, better stock Android 4.1 (or 4.2, possibly?) software. As long as it doesn't lose any features (like LTE, for example), that would be a very potent combination. We should know more in a couple of weeks. In the meantime, file this as a very possible "maybe" for your next phone, pending how the rest of the month shakes out. AT&T's version will be available November 2nd, and Sprint's will be available on November 11th.